I had a card in my book that says the flour is a misprint. Use 3/4 cup quinoa flour or 3/4 cup gluten free flour mix for the all purpose flour. Good pancakes, hearty enough to stand up to the berry compote. If you follow the instructions, each pancake will be miniscule (only 2 Tbsp batter each); I made them my usual size, about double that. The pancakes stuck to the griddle, so they overcooked a bit, but I think that was my griddle and not the recipe. Would make again, with or without the compote. I just made the waffles, not the ricotta-orange topping. The waffles were delicious with just the right amount of buckwheat flavor and sweetness. We enjoyed them with jam or maple syrup. I will definitely make these again and would like to try the topping. I used 6 Tbsp butter and 4 Tbsp turbinado sugar; the waffles turned out plenty rich and just mildly sweet, perfect with maple syrup. They baked up beautifully crispy on the outside, with a pleasant chew from the granola. Unlike some waffles I've made, these did not stick to my waffle iron. I have a round waffle iron and got 11 waffles. My family really liked these. A nice muffin, mildly sweet. Still fresh tasting in the morning when baked the night before. I got 11 muffins using my normal muffin scoop. I'm not sure if I liked the crunch from the millet; I might leave it out next time. Delicious, mildly sweet muffins. I mixed the batter the night before (without berries), then finished in the morning. Paper liners are important to avoid sticking/collapsing, and spraying the paper liners helps them peel off cleanly. I couldn't find spelt flour so I substituted whole wheat pastry flour. I had to add a bit of extra liquid for the dough to come together. The scones were quite tender, but lacked flavor. Neither the pumpkin nor the spices really came through, just the glaze. Maybe spelt would be more flavorful. Figs go really well with coconut. The oatmeal was delicious, if a bit rich, even when using reduced fat coconut milk. This recipe calls for more sugar than I usually put in baked oatmeal, but I'm sure that's partly why I thought it was so good. Yummy-a slighter healthier version of our favorite cookie. Rolling them in all natural sugar made them extra crunchy and delicious. Love this pate brisee recipe! So delicious - the flavour is complex and equally wonderful as a base for quiche and fruit. I loved this-I but it was deemed 'not sweet enough' by my kids and was left largely uneaten, so therefore will not be making this one again. A tasty, hearty pumpkin bread. The ground pepitas add a nice flavor. I also sprinkled some on top. Perhaps this isn't the best pumpkin bread ever (Tartine's is amazing), but I like that it's heathier, and my family enjoyed it. I had trouble understanding the shaping instructions (hadn't made Parker House rolls before) so I had to google it. I used the stated 8"x8" pan size, but that seemed way too small - had to squeeze the rolls in there. They rose A LOT, especially the middle ones, and needed extra time in the oven to bake through underneath. Next time I'd use at least a 9"x9" pan or even 9"x13". Don't skip the salt at the end; the rolls are bland without it. The rolls were pretty good, but the butter doesn't come through like it does in the standard white flour version. A must-have for every baker, with 130 recipes featuring bold new flavors and ingredients. 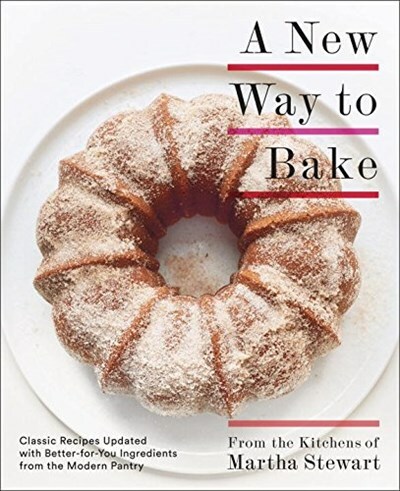 Here is the go-to cookbook that definitively ushers the baking pantry beyond white flour and sugar to include natural sweeteners, whole-grain flours, and other better-for-you—and delicious—ingredients. The editors at Martha Stewart Living have explored the distinctive flavors and alluring textures of these healthful foods, and this book shares their very best results. A New Way to Bake has 130 foolproof recipes that showcase the many ways these newly accessible ingredients can transform traditional cookies, pies, cakes, breads, and more. Chocolate chip cookies gain greater depth with earthy farro flour, pancakes become protein powerhouses when made with quinoa, and lemon squares get a wonderfully crumbly crust and subtle nutty flavor thanks to coconut oil. Superfoods are right at home in these baked goods; granola has a dose of crunchy chia seeds, and gluten-free brownies have an extra chocolaty punch from cocoa nibs. With a DIY section for making your own nut butter, yogurt, coconut milk, and other basics, and more than 150 photographs, including step-by-step how-to images, A New Way to Bake is the next-generation home-baking bible.